Intended for advanced readers, this is a review of all relevant techniques for structure analysis in one handy volume. 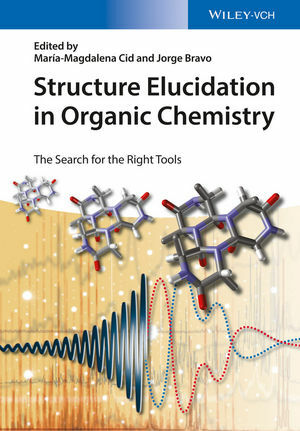 As such, it provides the latest knowledge on spectroscopic and related techniques for chemical structure analysis, such as NMR, optical spectroscopy, mass spectrometry and X-ray crystallography, including the scope and limitation of each method. As a result, readers not only become acquainted with the techniques, but also the advantages of the synergy between them. This enables them to choose the correct analytical method for each problem, saving both time and resources. Special emphasis is placed on NMR and its application to absolute configuration determination and the analysis of molecular interactions. Adopting a practical point of view, the author team from academia and industry guarantees both solid methodology and applications essential for structure determination, equipping experts as well as newcomers with the tools to solve any structural problem. Magdalena Cid received her PhD from the Universidade of Santiago de Compostela in 1990 and did postdoctoral stages in Sandoz Pharma, now Novartis (Basel, Switzerland) and The Scripps Research Institute (La Jolla, CA, USA) mainly dealing with synthesis of nitrogen-containing compounds. In 1996 she joined the Universidade de Vigo where she has become an associate professor. She is interested in the design, synthesis and characterization of chiral (macro)molecules and the usage of chiroptical properties and NMR (scalar and dipolar coupling constants) for total elucidation of their structures. Jorge Bravo is professor in the department of inorganic chemistry at the University of Vigo. His research interests encompass organometallic chemistry of group 7 - 9 metals, the development of water-soluble complexes, and their structure elucidation. He joined the University of Vigo in 1978.